How about surprising your family with pizza while camping? I used a pre-made pizza crust that comes in a tube. 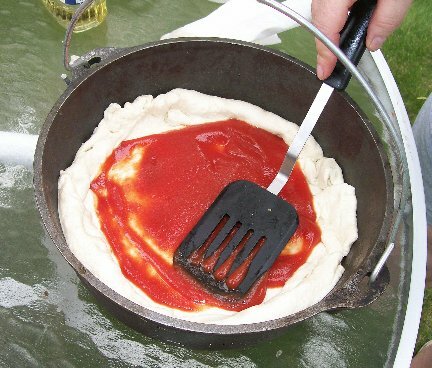 When going camping, that is a lot easier than taking flour and the other ingredients to make pizza dough. 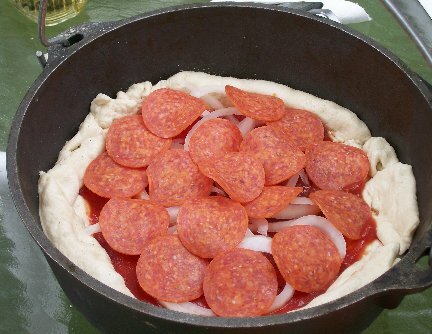 Remember, any type of pizza that you can make at home, you can make in a Dutch Oven! 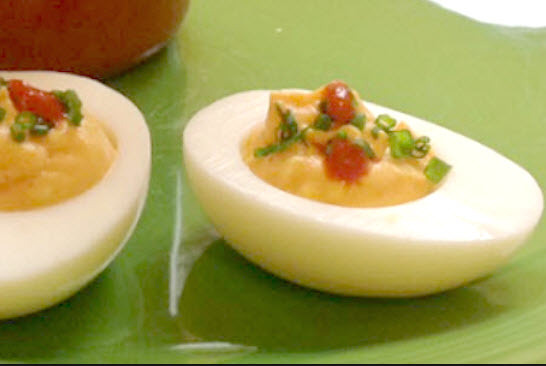 The following recipe and photos are by Eileen Troemel of Janesville, Wisconsin (near Madison). Check out Eileen’s very interesting and informative article on Dutch Oven Camp Cooking. More great Cast-Iron Cooking Recipes and Pizza Recipes. Prepare your fire using either charcoal coals or wood. Eileen is using the charcoal coal method for her Dutch Oven Camp Cooking. 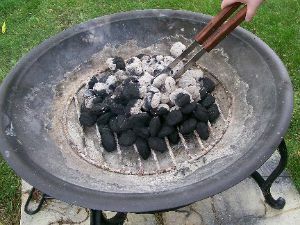 (2) Fire pit with coal – using backyard fire pit to cook on. 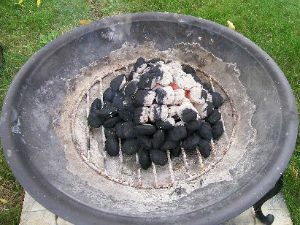 (3) Coals being shifted around so more of them will get hot enough to cook with. (4) Pour vegetable oil in the cold Dutch Oven, spreading it around the bottom and sides of the Dutch Oven. (5) Take the pizza dough out of the tube and split it in half. Spread half of the dough in the bottom of the Dutch Oven. Since the tube of pizza dough was meant to be for a rectangular pizza, I had to patch it and spread it around the pan. If you have two Dutch Ovens, you can make two pizzas at once. (6) Spread the tomato sauce over the pizza dough and sprinkle with garlic powder, salt, and pepper to taste. Add sliced onions and sliced pepperoni. If you would like to add additional toppings, now is the time to do it. (7) Pizza ready to put over the hot coals. (8) Place the Dutch Oven with the prepared pizza on the hot coals. (9) Place the lid on the Dutch Oven and place hot coals on the lid to start the baking process (this allows the dough to bake and the toppings to cook through). Bake for approximately 10 minutes or until done. (10) After the pizza has cooked approximately 10 minutes and the dough is baked, remove the lid. (11) Sprinkle the mozzarella cheese and cheddar cheese over the top of the hot pizza. (12) Place lid back on the Dutch Oven and let the cheese melt. The more hot coals placed on the lid, the faster the cheese will melt. (13) When cheese is melted, remove lid and then remove the Dutch Oven from the coals. Your pizza is now done. Serve to your family and enjoy! Barbecued Chicken Pizza – Substitute barbecue sauce for tomato sauce.Breakfast Pizza – Use Crescent Rolls, eggs, and hash brown potatoes. What temperature are you asking for? Can this be adapted for the oven instead of coals? This is genius. I can’t wait to try it. I have this massive Dutch oven that is too bilg for the two of us…lol. Now I have a use for it next camping trip! Love that I have a Dutch oven, bought it about a year ago along with 4 other cast iron pans, now my family have the interest in camping so I bought a tent, chairs, air mattress, cooler etc., so we are going! I grew up camping and love that I already have this, I can’t wait to try all the receipts. I love to cook and while camping is going to be amazing. I am sure its going to be a challenge-I’m hoping it works out.